Quality Bicycle Products, Inc. of Minnesota has issued a recall of its Salsa brand Minimalist bike racks. There have been two reports of the bike racks breaking at the mounting straps and the riders getting injured due to subsequent falls. Presumably, the falls occur when either the rack gets stuck in the back tire/wheel or a load on the rack becomes unstable. Manufacturer: Salsa Cycles, a wholly-owned brand of Quality Bicycle Products Inc., of Bloomington, Minn. Hazard: The L-shaped mounting straps used to attach the bicycle rack to the front of the bicycle can break and cause the rack to fall while the bicycle is in use, posing a fall hazard to the rider. Incidents/Injuries: Salsa Cycles has received two reports of bicycle racks breaking at the mounting straps, resulting in minor injuries from falls. Description: This recall involves all Salsa Minimalist bicycle racks sold after January 2011. The racks are made of tubular aluminum with a black or silver finish, and can be installed on either the front or rear of a bicycle. The recalled bicycle racks have steel mounting brackets, identified as straps, with a single hole in the center used to mount the strap to the bicycle fork. "Salsa" is printed on the side of the bicycle rack. Keating Law Offices has significant experience and success with product liability cases and injuries resulting from bike usage. In Illinois the manufacturer of a product can be held liable when their product fails and the person was using the product in a reasonably foreseeable manner. Obviously, if would be reasonably foreseeable for a rider to expect a bike pedal to not break so any injury that occurred could be the basis for a claim against the manufacturer. The attorneys at Keating Law Offices have handled numerous product liability cases. Earlier this year the firm settled a significant product liability case for a rider who suffered a severe injury when the fork on her mountain bike failed while landing a jump. The specifics of the case and the terms of that settlement are confidential pursuant to the settlement agreement. 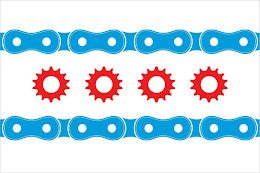 If you have any questions regarding this post or an issue involving a bicycle accident Illinois personal injury law, please contact Illinois Bicycle Attorney Mike Keating at 312-208-7702 or MKeating@KeatingLegal.com 24 hours a day, 7 days a week. All e-mails and phone calls are returned promptly. All initial consultations are confidential and free.